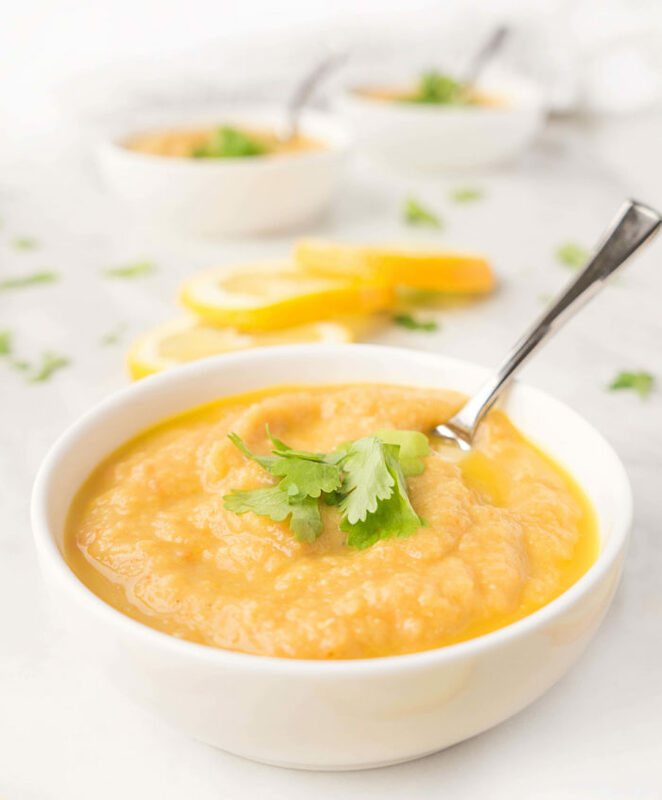 I’ve always been a lover of soup, but now that we have a little one on solids who requires softer textured foods, soup has seriously become my new best friend. And both my guys gobble it up in seconds. That is the makings of a good meal. I mentioned in my Chicken Noodle Soup post that once the cooler weather arrives, I’ll often cook up a large batch of soup at the beginning of the week, and the whole family will eat it throughout the week as a quick and easy lunch or dinner. 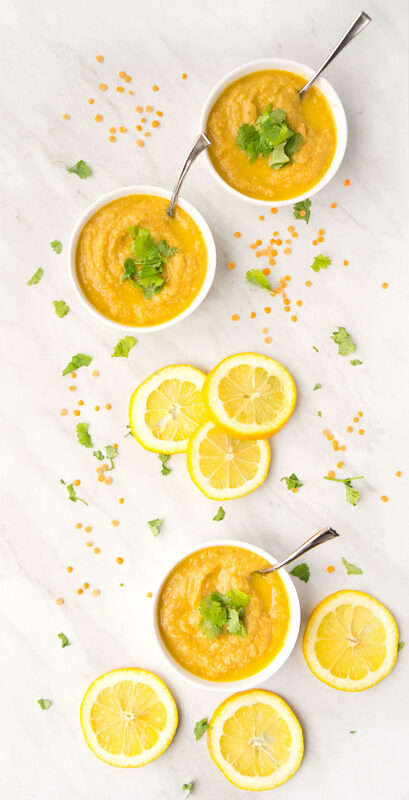 We’ve been doing the same thing with this Lemon Lentil Soup and it makes life SO much easier than wracking my brain trying to come up with some extravagant dinner night after night. Although it might look like I’m always cooking up a storm, I’m not. With the chaos of chasing after a little one and trying to get done everything that needs to get done in a day, I struggle with getting healthy meals on the table too! So I totally understand where you’re coming from. 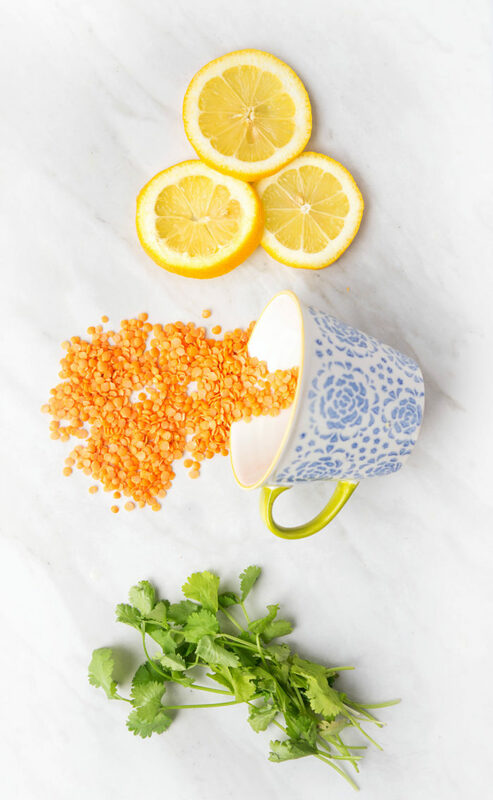 This lemon lentil soup, however, comes to the rescue every couple of weeks. There is minimal preparation required other than chopping up some onion, carrots and celery and throwing it into a pot. Add some red split lentils, spices, broth, and lemon juice to the mix, and you’ve got one tasty and healthy dinner on the table in less than 30 minutes. It makes for a balanced meal because it not only contains the protein, fibre and iron-packed lentils, it also has quite a few veggies hidden in there as well. I highly recommend topping this soup with some chopped cilantro and serving it along with a salad like this Roasted Beet, Butternut Squash & Kale Salad or this Spiralized Greek Cucumber Salad. Although the soup is quite filling on its own, I always like to pair it with a nice hearty salad to make it more of a complete meal. I also suggest using a no-salt added broth for the soup and adjusting the seasoning at the end. If I’m serving this to my baby, I’ll leave out the salt altogether to limit his sodium intake, and my husband and I will season our own portions accordingly. You can either leave it slightly chunky or puree it until completely smooth. I usually puree it using my immersion blender until mostly smooth with maybe a few chunks here and there. I like a nice thick creamy soup. You may need to adjust the broth after pureeing it until you achieve your desired consistency. You can also double or triple this recipe and freeze the soup in containers for future use. Another huge time-saving strategy for getting healthy meals on the table FAST. 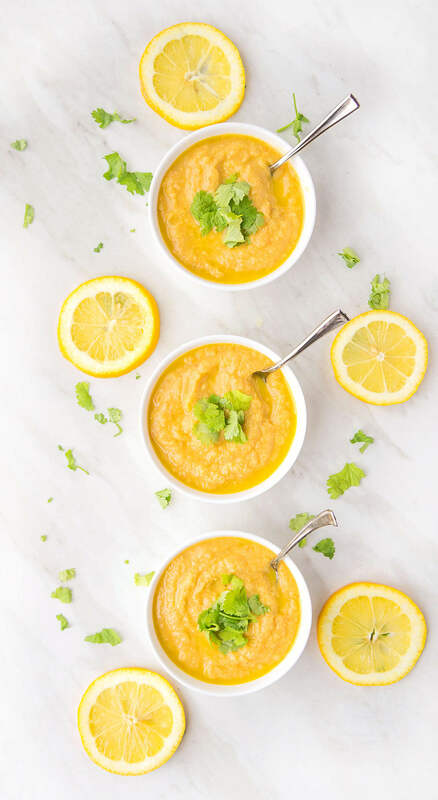 So next time you’re looking for a quick and easy soup that’s both healthy and hearty, add this Lemon Lentil Soup to the list! Heat oil in large saucepan or Dutch oven. Add onion, carrot, celery, garlic and red pepper flakes and cook on low heat for approximately five minutes or until vegetables have softened. Add cumin, lentils and broth to the saucepan and bring to a boil. Reduce heat, cover and simmer until lentils are tender and soup is beginning to thicken, about 20-30 minutes. Using an immersion blender, blend the soup until smooth, or leave some chunks if desired. Alternatively, you can transfer the soup into a blender to puree it. Add extra broth to thin it out if necessary. Add lemon juice and stir. Serve sprinkled with chopped cilantro.